Could long lines at the Department of Motor Vehicles soon be even longer? Just last week, Gov. Malloy said the modernization of the DMV is a priority for his administration, and new system-wide software upgrade should make that happen. But the NBC Connecticut Troubleshooters learned the same system caused massive delays in other states. It’s fair to say most of us dread making that trip to the local DMV branch. “The line was so long I had to turn around and run out. I just don’t have the time to do it. I’m sorry,” said Guy Simonian of West Hartford. Right now, the DMV says the average time it takes to get up to the service counter is a little over a half hour, not including how long it takes to complete your transaction. “Coming to do anything here is a long wait, a long wait. You've got to expect to spend some time," said Bruce Stone of South Windsor. After two false starts, the latest attempt at bringing the agency into the 21st century is well underway, according to DMV Commissioner Melody Currey. “We’ve got to come up to today’s world so that we can deal with all of the young people especially that have iPhones and iPads and are communicating in a different way,” Currey said. Here’s the catch: the software being used by the Connecticut DMV, made by the 3M Corporation, has a mixed tracked record in other states. In Montana, the state says it's running more smoothly after a bumpy rollout five years ago. Registrations and titles there are handled on a county level, by people like Yellowstone County Treasurer Max Lenington, who spoke with us via phone. “We actually had people camping in the lobby of our courthouse,” Lenington said. Lenington says that while the 3M system tracks more data, customer waits have not gone down. Two years ago in Kansas, the problems with the new software were worse. Residents dealt with five-hour lines for titles and registrations, and waits for critical services that went on in some cases for a week. While those issues have smoothed out, the drivers’ licensing software has not been released in Kansas. “All enterprise modernizations are always complex and always have some type of challenge,” representatives from the 3M Corporation said, adding that the company remains “very optimistic” that the revamped registration, title and license rollouts in Connecticut will perform well. But Connecticut’s DMV admits the $26 million-dollar software package here could have problems, at least initially. "There may be large or small glitches that we have to address. So I really wouldn’t be safe in saying there absolutely won’t be any waiting time," said Currey. Parts of the new software are already in operation for dealer and repairer transactions because this project is being rolled out in phases, instead of one large “Big Bang,” as the commissioner calls it. For the general public, the new system should be issuing vehicle registrations and titles by this fall, and driver’s licenses by the fall of 2015. This would put the five-year project about nine months behind schedule, according to project manager Nancy Dumais. “And when you start these, everybody has dates, right? But until you start to look at the work and pull the covers back, you really don’t know what that’s going to look like. You can’t,” Dumais said. But the wait will be worth it, according to Dumais and Currey. “We need your address once, we won’t have to change it in every single car that you own, and every handicap placard, every driver license, and anything you do at the DMV we change your customer address and that’s it,” Dumais said. Clearly, this is a huge effort. The DMV will be moving 40 million pieces of data into a new system. So why does our DMV believe it will successfully navigate all the potholes other states didn’t? Currey says in the cases of Montana and Kansas, for example, many of their DMV functions are done at a county level, all run by different managers. “The advantage that we have in Connecticut is you have one organization that controls all of the branches,” Currey said. The state DMV also visited Montana, and has been visiting branches here to see how employees are learning the new 3M software “so that the staff involved will not be shocked with the rollout, it’s not a product they’re not gonna be familiar with, and again, lessons learned from the other states, we’re trying to train early and often,” Dumais said. 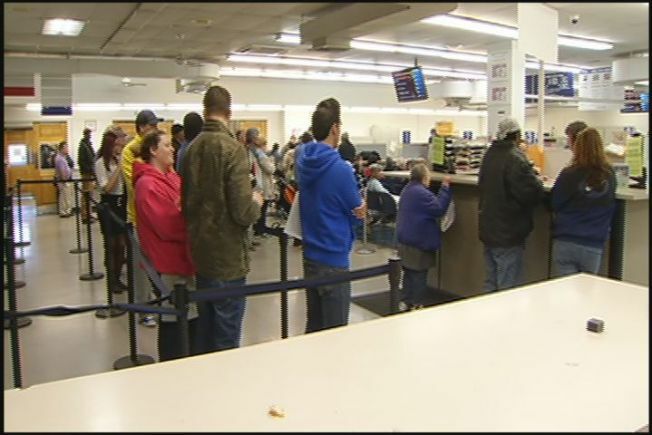 DMV sources familiar with the situation, however, told the NBC Connecticut Troubleshooters that DMV employees testing out the new software say it's plagued with problems and doubt the rollout will go smoothly. DMV customers we spoke with are hopeful, although they have a have a healthy dose of skepticism. “So we’ll see if the software is squared away," said Joe Marino, of Cromwell. "We should be in good shape, right?" Dumais said it looks like the rollout may be delayed. The NBC Connecticut Troubleshooters will keep a close eye on how this massive modernization project by the DMV goes.